This is a short book about goal setting and organize your day. 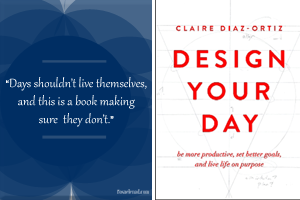 In Design Your Day the author compiles all the techniques she uses to accomplish her goals. I’m open to add ideas that contribute to plan my year but I didn’t read anything new in this book. Moreover, the examples revolve mostly around reading and I expected some examples as a mum that never happened. It’s an OK book and if you have not read anything about goal setting it is a good way to start. Recommend: Read the sample before buying.